Quality Silver Medals from Aford Awards. We have a great choice of Silver Medals - have a browse above! All our Medals can be engraved with any text you require. You can be sure to get the best prices on your medals with Aford Awards. Why not present outstanding team members with a reward they can treasure for years to come? At Aford Awards, we pride ourselves in offering a range of stunning, personalised silver medals encased in a luxury presentation box. We offer free engraving with every medal and trophy purchased to create a unique and personalised reward for individuals participating and winning events, competitions, leagues and tournaments. All of our medals can be engraved with any text required and can be easily requested when placing your order. Each of our medals, sports trophies, cups or crystal awards include a 60 character limit so there is plenty of room to get creative! Each of our silver medals is presented in a unique velvet or wooden presentation box depending on which medal you choose to purchase. We provide a range of medals to a variety of sports sectors including Golf, Darts, Pool and Snooker, Rugby, Motor Sports, Cycling, Cricket, Football and Athletics medals. If you require something a little bigger than a medal, we also offer a range of silver and nickel plated cups with free logo engraving for something truly special. We love to provide schools with high quality, good value sports day medals and trophies to give children a well-deserved reward for taking part or winning a sports day event. At Aford Awards, we are proud to offer competitive prices without reducing the quality of our products. Our medals and trophies are produced to the highest quality using luxury materials to create something that individuals can be proud of. We also offer a price promise to all of our customers to ensure that we provide the best possible prices on the market. Our price promise guarantees that if you find a better price elsewhere, we will beat it by 5%. If you have a number of medals to purchase, why not place a bulk order with us to receive a discount off of the order total? Visit our price promise page to find out more. As previously mentioned, each of our silver medals and trophies comes complete with a free engraving which we delicately do using our cutting-edge engraving machine. We also sublimate printed plaques during busy periods, however, if you prefer to have your order engraved rather than printed please do let us know and we will accommodate to your needs. We can also print your club logo or badge onto our range of trophies; simply let us know at the time of ordering. Our engraving and personalisation service is also available to clients wishing to engrave a product they have purchased from elsewhere. We can engrave all surfaces not just medals and trophies, including jewellery, iPhones, gifts and tableware. The price for our engraving and personalisation service is dependent on the material of the product. What's more, if you're unable to find the medal you're looking for - we also offer a bespoke medal service. This means you're able to create a one-of-a-kind medal crafted by your needs and requirements. 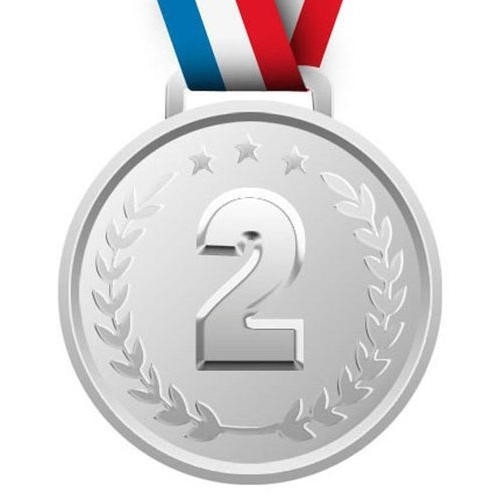 You can order our silver medals quickly and easily online 24 hours a day, 7 days a week, however, if you would like to discuss your medal requirements with our fully trained and knowledgeable staff, please feel free to get in touch via email or call 01622 738711. Alternatively, if you cannot find a medal or trophy suitable for your clubs needs, please browse the full range of sports medals for a wide variety of sports industries including our selection of high-quality swimming medals and martial arts medals. Our Silver Medals received an average of 4.75 out of 5 based on 394 reviews.